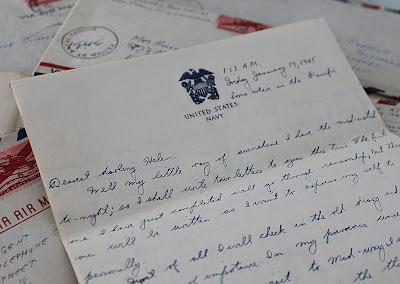 Last month, I did a post about 92 WWII love letters I bought at a farm auction. I have been beyond thrilled to read through the words of Irwin & Helen...I read each letter he wrote her, then her response...it is like being in their converstation. and then he calls her his "little ray of sunshine"...isn't that just the cutest thing ever?? This letter goes on to talk about his daily life while he is away. What he does for his job on the ship, what the other guys are doing. He is careful to not reveal too much, the sensors would never send it on to her if he did. Can you imagine? Every single personal word your husband wrote you while you were apart being read by someone else? Yikes. Parts of the letters have me laughing outloud. Apparently she is a not-so-great cook, and he made a comment about not being ready for home cooked food any time soon. Umm....Hello, Irwin - I wish I would have been there to help you out. Someone needed to imform you that women are not amused by jokes like that. Needless to say, Helen did not find it to be funny at all, and he apologized for about 13 letters afterwards. And I have discovered Irwin has a little naughty side to him, too! He throws in a comment or two that I am sure they would not appreciate me reading. I guess years away on a ship will do that to a guy...wink...wink. But most of all, he begs to hear about the mundane, day-to-day things she is doing. He wants to hear details. What she did...who she saw...what they talked about. I admit, at first I thought Irwin may be just a little controlling.....but then he says why. When he lays down in his bunk at night, he falls asleep imagining he is there. Remembering what life was like before he was...somewhere in the South Pacific...all those miles away from her. He talks about how much he is missing the little things. Going bowling, mowing the lawn, fixing their car, even painting the house. The simple things in life really are the most important, aren't they? "sending all of my love and kisses now and forever, your loving, loyal but ever so lonely husband Irwin"
I have been trying to figure out what to get my husband for Valentine's Day. Cologne? Dinner and a movie? A new watch? But really, when it comes down to it...we like the every day things in life just like Irwin. I think I will just cook him his favorite dinner...and he can build a fire. We will pop open a bottle of cheap champagne, drink it out of the wrong kind of glass and enjoy a night in. Wishing you a Helen & Irwin kind of day...enjoy the simple things in life. How lucky you were to get these letters. It's such a sweet chronicle of life back then. And true love. I love how it has inspired you to have a simple Valentine's Day. Me too! Oh those letters are so sweet and amazing! Do you know if he made it home to her? That's now what I'm dying to know! What happened after he left the South Pacific? Did they live forever as a very cute old couple with lots of kids? I also had a crazy dream that I met you - we went to visit your Mom, went junking, you stubbed your toe badly on plywood. You also had the most amazing old mailbox ever - I don't know why, but I want that dreamt up mailbox!! I love these - they make me smile! If this were published I would buy it. I've been thinking of pulling the letters my babe and I wrote while apart during college and through our engagement. I've wanted to put them in chronological order and make copies for our children. They will see how young and hopeful and silly we were, but mostly how much in love we were...and are still after 31 years. I just love Irwin and Helen! I love them! I love old letters, journals, anything that describes real genuine life. I have a collection of letters written between my great-great grandparents that date back to 1896 and I love and treasure them! Oh, i Just LOVE that you posted about these letters. Can you imagine? writing something today and having someone YEARS from now read it? I think that is sooo romantic to have those to read!! lucky! Those letters sound amazing and your Valentine's Day sounds perfect! Oh, wow! I envy you. Can you publish them? Thank you so much for sharing bits and pieces of these letters, and for the reminder that the little things are what we remember, what we miss. I found your blog a week or two ago and have been thoroughly enjoying it! One of the sweetest post ever!! Thank you for reminding me it's the simplest things in life that makes me happy! thanx for bringing back the innocence of love and marriage. I am sure we will be celebrating the same manner...here comes more snow! This post made me tear up....what a treasure those letters are. Although it's sad that they are no longer in the "family", I'm glad they were bought by someone who appreciates how special they are. Thanks for this post, reaffirming the "little things"
I love this - how wonderful that you are able to enjoy these letters filled with love and such history! I would have loved to read all of them too. Your v-day sounds great. Have a wonderful weekend. What a dreamy find, Mary! Have a beautiful Valentine Weekend with your cupcake! What an amazing find! I have all the letters my grandpa wrote home (he hadn't yet met my grandma, though) during WWII, and all the letters to and from my grandma's brother while he was stationed overseas. I even have a few that my great-grandpa wrote to my great-grandma during WWI. Those letters are some of the most amazing treasures. Reading this made me sad, in a way. 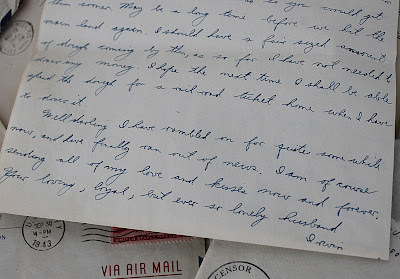 What a treasure you found in those letters...love the sweet way they used to start and end letters. By the way, did you receive the email I sent you on the 11th? Hi Mary! These letters are just so cool...I love old letters!!! And how fun that you are actually reading them...thanks for sharing...these are so special! 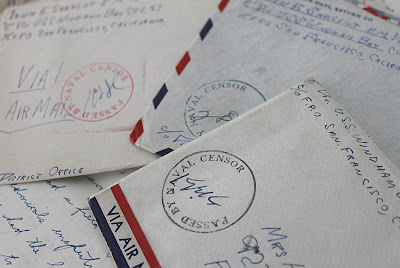 I have the letters my father wrote to my mother during WWII. Very happy to have them, but I need to figure out a way to organize them. Right now they are just in a box. My goodness...those letters just broke my heart, in a good way. What a WONDERFUL treasure you've found. Thanks so much for visiting my blog! Publish them. Make them into a movie... something.. just give us MORE!